Some folk may be thinking about royal coronations and Yorkshire has its own memorial to Queen Victoria’s. One of several caves (32) in Craven was discovered in 1838 and named Victoria cave after her coronation. It may not be the oldest bone-cave nor the first to be discovered in Britain but it’s discovery fired the imagination of Victorian archaeologist. 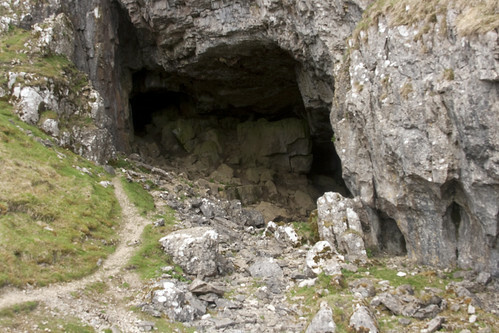 The modern history of the cave’s discovery is based on the dog of Michael Horner from Settle. The dog is said to have been chasing a fox down a hole and it squeezed through into the cave back in 1837. Joseph Jackson with William Boyd and R Tiddeman organised excavations. At three different layers in the cave, discoveries showed earlier occupation. Bones of animals that resembled elephants, hyenas and other tropical beasts were the earliest bone-cave remnants at 130,000 years old (dated to an Upper Pleistocene interglacial time.) The onset of the great Ice Age covered these remains under deep clay. As the Ice retreated in the Mesolithic era 6000 B.C. man occupied the cave leaving harpoons and tools of the Azilian culture and then more bones and some iron age relics. The Romans may have used the cave as a dwelling and enameled jewellery, bronze and more bones dating back to 250-360 A.D. were also recovered. The cave is situated 1450 feet above the current sea level amongst the Langcliffe scars. It faces west with ‘bastions and ramparts of limestone leading down to green pasture. 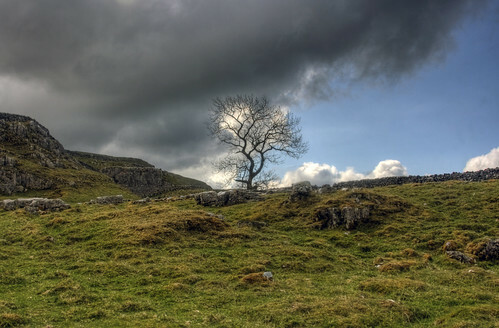 The area is part of the Craven Fault and is within 2 miles of Settle. Jubilee Cave and Attamire cave can be found very near by. A favourite walk heads out of settle towards Langcliffe and Stainforth turning right at Catrigg Force. ‘Victoria cave entrance’ by Dissonancefalling ‘when excavated, somewhat destructively, bones dating back 130000 years were found as well as 11000 year old harpoon tip which is first evidence of people in the dales.